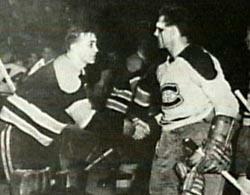 While traveling in Buenos Aires with his family, Guy Lafleur was sucker-punched by a thief. "It was like one of the players from the Bruins." Just like in his playing days, Lafleur had no enforcer riding shotgun to protect him from such thuggery. Reports indicate that prosecutors hope to charge the thief not only with assault and robbery, but would also like to slap him with the instigator. Saku Koivu appeared to be more crushed than anyone after losing the gold medal game to Sweden. He probably has a better grasp on just how rare those opportunities are, after missing out on the 2002 Olympics. He was busy that winter fighting non-Hodgkin's lymphoma. An article by Mark Brender in the most recent print edition of The Hockey News suggests Bob Gainey did the Ottawa Senators a favour by signing Saku to his 3-year, $4.75M per year deal. Brender insinuates that one Olli Jokinen will expect to be paid even more. That would make it that much more difficult for Mike Keenan to get him under contract (so the theory goes), which would make a deadline trade to the Senators more likely. Should Jokinen receive more? His numbers are a little better. He has size. He's younger, which suggests that after three years his contribution should not slip as much as Koivu's. However, I'll point out one small thing: Look at how the two players were used in the Olympics. 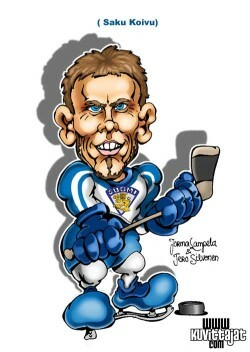 They were the top centres on the Finnish team. 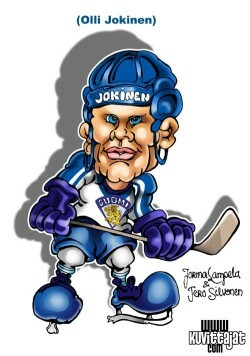 Jokinen played well - no question - but Koivu was incredible. He was arguably the best forward in the tournament. Just something to consider before assuming Jokinen is worth bigger money than the Habs/Finns' captain. Sixteen of Canada's 24 medals at the Olympics were won by our female athletes. Why aren't the men holding up their end of the bargain? And, although 24 winter medals is durn good, Canada's total doesn't approach the per capita totals of other top "winter" nations like Norway, Sweden or Austria. Why is that? I have a theory, and it's pretty simple: a huge number of Canada's top natural athletes are fleshing out pro hockey leagues all over North America. The vast majority of pros making a living in the AHL, CHL, ECHL, SPHL, and UHL are Canadian players. That's thousands of top athletes playing hockey and only hockey. How many of those guys just aren't good enough to crack the top hockey leagues, but would make formidable speed skaters or skiers? Even when you look at the athletes in other sports, hockey has informed their pursuits. Jeremy Wotherspoon took power skating classes to improve his hockey skills, and Jeffrey Buttle started out figure skating as a way to fast-track his skating for hockey. Canada lacks diversity in it's athletic endeavours. With the rise of womens' hockey, we might start to see the same effect in womens' competition. We're all about the hockey. Deep down, I'm fine with that. There has been more hand-wringing than I expected about the US hockey team's performance at the Olympics. At least the Americans have a good explanation for their team's performance: a glaring dearth of world-class players currently in their prime. Perhaps expectations were higher than was realistic. The US had a great showing in the '96 World Cup and the '02 Olympics, and their junior development has been great in the last few years. So what went wrong at this event? I have yet another theory. Hockey player development in the US was on a slow and steady rise. Then there was a spike of talent born on or around 1970 because of the 1980 Miracle on Ice. This bunch of impressionable kids - Leetch, Weight, Amonte, Richter, et al - went on to become a solid core of world-class players and produce the '96 and '02 international results. Meanwhile, development went back to it's slow and steady rise. Once the circa-1970 crowd went over the hill, the drop off in talent was exposed. No offense to Gionta, Gomez or Rolston, but Mike Modano they ain't. That doesn't mean development took a step backward. Rather, it merely returned to it's normal steady growth. This effect is not likely to be observed in Canada, where development is running at full capacity all the time. Where hockey is more peripheral in the US, it's popularity among youth will be subject to external forces, like National Team victories. Now we are seeing the next great crop in Kessel, Johnson&Johnson, etc. Is this bunch the result of the natural progression of US hockey, or is it another spike due to the '96 World Cup? Stay tuned for the next 15-20 years to find out. posted by Jeff J at 2:21 p.m.